In this worksheet, 'R' doesn't stand for reading and "writing," it stands for rhombus and rectangle! 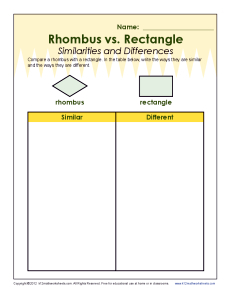 Your student will write the similarities and differences between the two shapes. It's a great way to practice 5th Common Core Standards for Geometry. Other grades may find it helpful as well.